Following Chipotle’s (NYSE:CMG) earnings report, two very different and large gaps off and on the price chart have investors questioning whether now is the time to buy Chipotle stock or if they should wait for conditions to simmer. 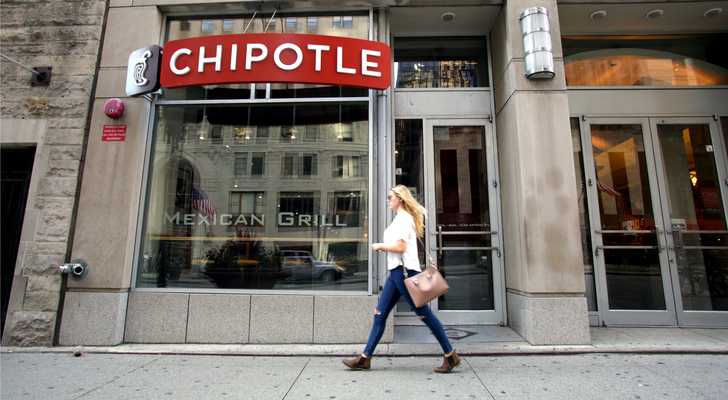 By some measures, Thursday was a sizzling day for Chipotle stock. Shares of CMG gapped and rallied strongly to finish up nearly 11.50% to a fresh three-year high. Behind the bullish fiesta, investors celebrated items like year-over-year earnings growth of 2.3% on profits of $6.31. On the one hand, while not serving up the growth of yesteryear, Chipotle’s GAAP number nonetheless did deliver more evidence the fast-fresh burrito king is back on track following a couple years of well-publicized food scares. But in a move to remain transparent during its restructuring, the company also used non-GAAP figures as well. And that’s where CMG stock looks extra, extra tasty! Looking at earnings from a non-GAAP angle, which benefits from the company’s strategic closing of under-performing restaurants and relocation of its headquarters, CMG stock offered up sizzling profits of $9.06 and growth of 33% from 2017. Yummy, indeed. So, with this sizable profit gap off the price chart related to the two earnings numbers, which one were investors hot for? At the end of the day, there’s no definitive answer. Still, with top institutional names representing more than 60% of Chipotle stock’s shareholders, I’m willing to give credit that investors buying into CMG are smart enough to give the promotional non-GAAP teaser its due weight, but also recognize the possible limitations when they collectively gobbled up shares Thursday. On the CMG stock price chart another type of sizable gap looks unequivocally bullish. Thursday’s jump in the CMG share price launched it out of a “high” handle consolidation which rested on top of a large and healthy corrective “W” or high-level, double-bottom base. With the beefy pattern breakout also vaulting CMG shares cleanly above the 62% retracement level from its 2015 all-time-highs, my estimate for an initial upside target is conservatively priced from $650 to $700. Ideally, I’d like to see a simple multi-day pullback in shares based on a fairly aggressive position in shares outside the daily chart Bollinger Band. But in a less perfect reality, beginning to nibble today based on the big picture and being ready to accumulate Chipotle stock on weakness makes sense. Sure, some bears might warn Thursday’s reaction was helped in part by some of CMG stock’s near 10% short interest covering their you know what. To a certain extent that could very well be true. It’s also the case those bears have admitted defeat and been on the wrong side of the action for quite some time now. Bottom line, I don’t mind disrespecting the bear population and seeing the breakout in Chipotle stock as being “For Real” and one in which bulls can still profit from. Disclosure: Investment accounts under Christopher Tyler’s management currently own positions in Chipotle stock (CMG) and / or its derivatives. The information offered is based upon Christopher Tyler’s observations and strictly intended for educational purposes only; the use of which is the responsibility of the individual. For additional options-based strategies and related musings, follow Chris on Twitter @Options_CAT and StockTwits.